We have had the Nissan GT-R Black Edition here in the US since 2012. The Black Edition gets the red/black interior, unique Ray's wheels, and for 2013 a carbon fiber rear wing. In Australia, they have just announced the Black Edition for that market. Just to show you the bargain? we get in the US, in Australia the MSRP is $182,500 AUD($175,729USD) with a maximum drive off price of $199,990AUD($192,570 USD). In the US, 2014 the Black Edition comes in at $109,330. Same car, different market. Is the US market cheap, or the Australian market expensive? Its not all in exchange rate. Its not all in taxes or GST. MELBOURNE, Australia (27 May 2013) – Nissan has confirmed that a new edition of the all-conquering GT-R will be available in Australia from next month with the introduction of the Nissan GT-R Black Edition to the Australian market. The Black Edition sees the addition of skilled craftsmanship to the already breathtaking performance of the GT-R, with striking features such as an impressive carbon fibre rear spoiler and red and black interior treatment. Specially-commissioned Recaro front seats, featuring red leather-accented trim, offer ergonomic support and comfort for both track days and the daily commute. Metallic black forged alloy 20-inch RAYS six spoke wheels are super-lightweight to reduce unsprung weight, while also featuring knurled beads to help prevent tyres moving on rims under hard acceleration. “The GT-R Black Edition has already proved popular in other markets, so we are pleased to introduce this exciting model to Australia,” said Nissan Motor Co (Australia) Managing Director and CEO William F Peffer Jr. 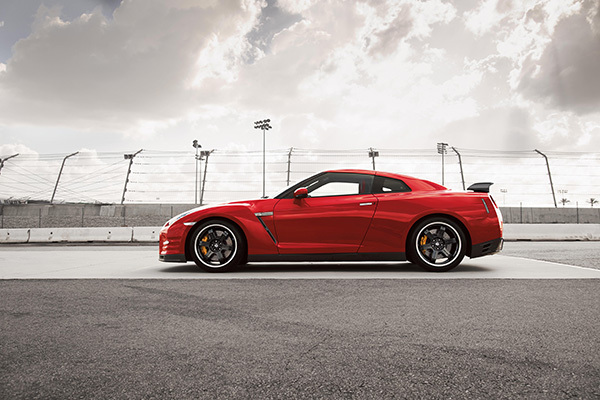 The Nissan GT-R Black Edition has a Manufacturer Suggested Retail Price of $182,500 (estimated drive-away price of $199,990*) and is available from authorised Nissan GT-R dealers from June. * Maximum recommended drive-away price based on registration in Western Australia including statutory charges, dealer delivery and luxury car tax. Excludes government, rental and national fleet customers. Prices will vary from dealer to dealer. Premium or prestige paint available at extra cost. Nissan Motor Co., Ltd., Japan’s second-largest automotive company, is headquartered in Yokohama, Japan, and is part of the Renault-Nissan Alliance. Operating with more than 267,000 employees globally, Nissan provided customers with more than 4.9 million vehicles and generated revenue of 9.6 trillion yen (USD 116.16 billion) in fiscal 2012. Nissan delivers a comprehensive range of over 60 models under the Nissan and Infiniti brands. In 2010, Nissan introduced the Nissan LEAF, and continues to lead in zero-emission mobility. The LEAF, the first mass-market, pure-electric vehicle launched globally, is now the best-selling EV in history.